Seventy days after Passover could mark the beginning of big changes in currencies, precious metals, and equities. Z3 contributor JM received a prophetic word on Saturday April 23, which was the first the day of Passover, which began at sunset on Friday April 22. He saw what could be the start of a U-turn in the markets beginning exactly seventy days from Passover, which would begin at sunset tonight, July 1. He posted the following comment on June 8 2016. “I feel prompted to share this. It may add to the overall picture developing. I’ve struggled to fully understand it personally so perhaps I need to lean on others. On passover 2016 (April 23) I had a vision of a table set against a wall. It was a half semi circle table. On the table I saw written the number “70.” The shape of the table had meaning for me because it appeared as a “U” shape, which is another form of “V,” which speaks of a fall and then a rise. As for the “70” I wondered if it meant a “U” in the markets beginning in 70 days. Straight away, I went to the calendar and calculated 70 days from Passover. It brought me out to July 2nd. About ten minutes later, I saw another vision of what appeared to be a shop shelf, it was quite high up, and on it was a price. The price was “$2.07.” This to me was a confirmation of July 2nd. Perhaps in the U.S. you would say 07/02, but overseas we say 02/07. Several days later I had this confirmed somewhat when in another vision I saw etched on a wall “70 days” and beside that was a “V.” It was from recollection etched in gold. Also yesterday I found myself thinking about these visions and I heard “Serge Ibaka,” who is a “power forward” for the OKC Thunder NBA team. I felt a prompting to look up his height and sure enough, his height is 2.07 meters. This also seems to be a continuation of the basketball theme, and could possibly point to a “surge” or a “powering forward” of the dollar on or beginning around 2nd July. Possibly alongside equity falls and a fall in gold. I don’t know why, but I find myself thinking of the phrase “up against the wall.” Both the table was hard up against the wall and the 70 days and the V were on a wall, which makes me think of Wall Street and with it equities and bearishness. I shouldn’t ignore though that the V + 70 days lettering was carved out (bearish) of a wall and painted in gold, pointing to a fall in gold/precious metals. Also “$2.07” was above eye level and appeared “top shelf,” to me that implies bullishness in the dollar. Serge Ibaka would seem to support this interpretation, although he could equally point to equity bullishness. BUT the assumption that I’ve made is that the “U” commences on July 2nd weekend. Perhaps there is a “serge” in the dollar on or around the 2nd July, which would push down metals significantly. It would seem too to fit in with my red Double decker theory which I initially felt represented currency/equities down, followed by currency/equities up on the return. God has given many revelations of future market activity, but putting them in sequential order can be challenging. I believe JM’s revelation confirms where we are on the timeline of what I have called the final four seasons of the U.S. dollar. I believe we are now entering into the grand finale of season one, setting the stage for season two. During season one, the dollar grows stronger and stronger until it becomes unbearable for the rest of the world, which results in the events of season two. JM’s vision of the U.S. dollar on the top shelf was symbolized by $2.07, which included the $ symbol with the date, July 2, based on the way dates are written in his nation, the UK. That does not necessarily mean the markets are all going to turn overnight, but anything is possible. Regardless of how it plays out, I believe we will look back on July 2 as a significant turning point. The flash vision I saw yesterday showing what I interpreted to be a “horrible decline” of the euro. 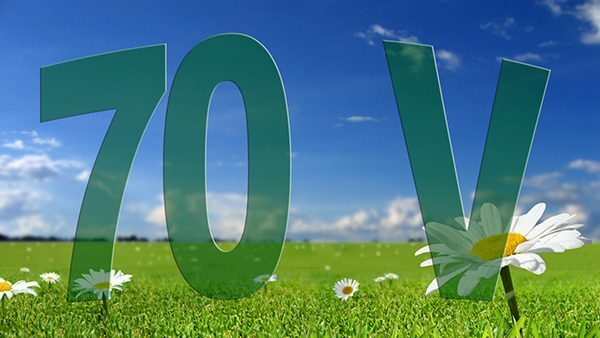 JM saw 70 and a V on a wall, which is interesting because on the seventieth day since Passover, the equities market just completed a giant V-shape, which started last week after the Brexit vote. The Dow dropped over 900 points after the Brexit vote last week, then rallied right back up to where it started. Two days prior to passover, the Dow finally completed the final leg of a long term W-pattern, reaching a top on April 20 2016. As I shared in my previous posts, the W-pattern is a long term bearish indicator, which means a big drop is coming, but after seventy days, the markets closed today very close to where we were on Friday April 22, 18,003.75 then versus 17,949.37 today. So we have effectively moved sideways during this period, but JM’s U-turn would mean the expected move down is coming soon. Regarding precious metals, JM saw the number “70” and a “V” etched in a wall in gold. He interpreted that to mean a drop in the price of gold begins 70 days from Passover. Lower prices for precious metals are consistent with the stronger dollar because prices for everything purchased in dollars would tend to go down. Gold prices moved higher in June, from $1,199 on May 31 to $1,345 today (Source: Investing.com), so a V or a U-turn would mean the prices would now start moving down. Since gold and silver prices often move together, I believe JM’s revelations confirm the dream I received on May 22, which I posted yesterday regarding a coming drop in the price of silver. Why would God choose to reveal a 70-day countdown to JM on the day of Passover? I believe this is another example of how God seeks to make His righteousness known to the nations (Psalm 98:2). He wants the world to know His righteousness always prevails in the end so everyone can choose to get right with him before it is too late. Ignoring His commands is foolish. Despite the choices made by millions of investors, God remains in control of global financial markets and decides when it is time to make things right, to settle accounts we have refused to settle. He has demonstrated this by aligning nearly every major market crash in history with Jewish holy days. Only God could do that! He is the same yesterday, today, and forever (Hebrews 13:8). He continues to operate on the same schedule He revealed in the scriptures, the same holy days He designated for ancient Israel. Just like He did with them, He gives us the opportunity to get right with Him by obeying His commands, but if we choose to go our own way, He ultimately intervenes to make wrong things right. It is far better for us if we make the right choice ourselves because it will not go well for anyone who rejects Him. In the Bible, the number seven represents completion and fulfillment, including the completion of punishment for sins (Leviticus 26:28). The number seventy has a similar association. For example, the Israelites were exiled to Babylon for seventy years (Jeremiah 25:11-13 and 29:10-14). Also, when Peter asked Jesus how many times he should forgive his brother who sinned against him, Jesus replied, “I do not say to you, up to seven times, but up to seventy times seven” (Matthew 18:21-22). I believe God’s revelation to JM demonstrated His desire to let everyone know these events are not happening randomly, but in His perfect time. So let it be known to everyone who has ears to hear, there is a God in heaven who reigns supreme and His judgment begins precisely at the right time, which He has designated according to His perfect schedule. Thank you Jonathon for taking the time to discern what everyone is saying and bringing it all together. The Lord is doing an amazing thing here. I believe He enjoys us working together to claim the blessings He so joyfully would have us receive. What a good God we serve! Jonathan, thank you for your hard work. I agree with your thoughts, and I appreciate your even-handedness where you balance a long-term bear trend and bearish prophecies with short-term bullish prophecies. I don’t usually dream market dreams but I remember waking up to a strange number of 2149. I thought to myself no way s+p could get that high and disregarded that number so I tried to break it down to 7+7+7+7×7 but what do I know… However you mentioned jm’s dream of 2137 which would be close…But please take it to the Lord because I’m not sure .. Thank you, Johnathan, for putting research which would have taken hours or days to find, right here in such an articulate format. I really appreciate it. That is such a selfless thing to do. Make the L-rd reward you for your kindness. Jonathan, thank you for taking such time and care in posting this summary. Jonathan, thank you for all of the time and effort this summary obviously required, and for your generosity in allowing the rest of us to benefit from this! Thanks for summarizing all this Jonathan. I hope not… I wasn’t counting on such a longer/higher ‘bounce’. I personally haven’t had any warning dreams or even anything market related this weekend, so I’m not sure what to do. In the past I have closed positions to limit losses only to see the market turn the next day and then wish I had more faith. However with a growing consensus that we are going higher it may be best to get out now and just watch. Taking a loss is never nice, but its better then getting cut out if we keep going up for 10 days. June 30th what is your understanding of what happens next? *could also represent a drop to 1948 (Dow 16537, 16619, 16672, 16786) SELL–then a bounce back up . A question to Phanuel. I see you posted your SELL’s. My question is where you say ‘Next drop to 1975–1988’. Did it already occur during the Brexit vote? If so, then our next point of sell is 1906? Or should we pay attention at the 1948 in the S&P as our next selling point? Just scratching my head. Take a look at the S&P chart. Brexit did not break the 2000 resistance level; so it is my understanding that the next drop will be 1988. GB. Wondering if you have the equivalent Dow numbers for 1,2,3 S&P markers pls? Phanuel, I see some new numbers I have not seen you post before, so I have to ask, were the 1906, 14936, and 16537 all specific numbers God gave to you as well? Right now, I’m watching for a close above or below 2093. If it’s below, we could very well be on our way to at least 1988. Will be interesting to see what happens. I usually wait till I get confirmation to release numbers. I saw 1906 a while ago and it was recently confirmed by SPY 191. Recently saw 16537 to add to the cluster of 16600s. With the close below 2093 today, are all leaning toward a continued downtrend for the near future? Any other thoughts? Second question/comment….I was thinking it would take an, “event” to drive the markets much lower, Is anyone else tracking that way or is this what would now be defined as technical crash? Thanks for your responses. I’m currently holding FAZ and UVXY. I’ve not had any personal revelation as to which direction we are heading, so I’ll be watching closely tomorrow. Hope you both had an enjoyable and relaxing weekend! TP. I’m running long oil, silver long (but hedged), and equities long. I’m either hedged or have moderately tight stops, because I’m not positive of my timeline location. If these directions manifest, then it creates greater confidence that the silver and oil downturn follows (probably quickly). After that, equities come down. If equities are moving up, I believe we’re going above 2120. Today’s action would not show up on my prophetic radar. However, if it continues down, then I would have to adjust. I don’t have any warning dreams that I’m working through. Phanuel – interesting that the VIX did nothing today at the close. UVXY only up .30 and TVIX only .02 when the DOW finished down over 100 pts. UVXY was up over 1.00 at one point today…..
My leaning is toward 10 days now. We will see how this week goes. I saw S&P at 2093 yesterday. I also had a dream in which I saw many different fighter jets (equity market) high in the sky. JR and JM may add to this. Shalom. Here is a link of what I shared yesterday about timing. I meant possibly a 1975.15-1988* SELL range and not 1998. Thank you very much. For clarity, are each of these seven points (possible) selling points to occur over a period of time? Do we have a ‘feel’ for what time period this may encompass? ES down 18, Midcaps down 19, NQ down 38, & Nikkei down 155. Its looking like the Brexit retrace is finished IMO, and its important to see that it put on a lower high than the previous high on Small caps (TF), meaning to me that the summer swoon actually started with the Brexit exit. Nasdaq is looking to break back under 100, 200, & 300 dmas soon, and Nikkei appears to be starting to crash, so this drop is just getting geared up. Looking for about two weeks on this one and to put it in cruise control down until we start to see the panic flushing phase likely middle to late next week. Best to all on Wealth Transfer Act. #2 for 2016……. Thank you John! Something’s got to give…..
Charles – Thanks. I agree…. Wait until the Nikkei breaks its past low (gets into crash territory), and we also break the Brexit low, which may be a bit of point of recognition (POR) as this bear market starts to create some fear/panic…….. Best…..
Phanuel – I like your style…. This is a process and we all learn as we’re moving forward. Providing support/resistance levels is a safe way to go, and the move under 2093 is telling. I’m certainly encouraged by today’s action, and clues that the Brexit move back up was just a retrace will likely add fuel to the selling momentum and increase proof this could be a sizable move, which could hit the lower targets…. Best to you brother…. I like your style too. The chart from Brexit to today looks like James graph ( except for the greater than 80 Retracement). Shalom! Phanuel and John – I look forward to more goals to come so we can execute what we have learned from everyone and Gods revelations as well! Jeff – Gold usually smells something in advance. Thanks for the good chart! Best. Great post John ! Thanks for sharing ! John I’m in your camp again. After covering on the Brexit drop I am now in same full short position as before waiting for the next drop. Ignoring all the noise. I’m feeling pretty comfortable with this one… Also, the 4th is a new moon, and those can typically mark market highs.. Best to you and Sonia…. I see Peter Temple is also in agreement. Jeff – Yes, I visited the site and there is good info there. I believe the next 2 weeks will be important. Even though market moves comes in waves, I quit using Ewave about 8 years ago for various reasons, but I believe its very important to go back and study the 29 and 08 charts. If we hit my targets of between 1740 to 1800, I don’t think the retrace will be back above ATHs. If we don’t drop as much going into, say 7/15 to maybe 7/19, then we may go higher late Aug. and into early Sept. However, the important thing I think are these turn points, and the next low turn point and potential final top of the next bounce around the end of Aug./early Sept are basically how I’m trading the next couple of months. As long as these key points work out, I can make a lot of money regardless of how much the markets move and stay in the game, which is why I get spreads of high to lower put strikes. I don’t believe the July swoon will be anything like the coming crash in October, so I’m going to likely position a month early for that one and hold tight….. Best to all on the 4th. Jeff – Brexit retrace looking done to me here. ES futures now down 6.75, Nikkei down 100, and 120 min. charts on SnP, Dow, Nasdaq all firmly in sell mode tonight. If the high in futures holds under the Brexit high, then technically, things look excellent for the two week run down – Hold on tight!! The market is going down…… Pay attention to gold/silver (I know you know that) that just got hammered. If we can come back it’s a done deal (it’s going higher). They always hammer gold just before the market dives, because a falling market AND rising gold is their WORSE nightmare. If the metals make a comeback as the market continues to fall they have lost control. Either way the market is toast. Gold came all the way back. Jeff, do you mean there will be gold reversal today when london opening ? Yes, I’ve been seeing the 7’s manifestation, but my difficulty has been in applying them. Maybe better said….I’ve looked at them as being markers for, “bigger” events or market moves as opposed to timeline markers giving us clues that we remain on the proper path. Possibly due to impatience on my part, I’ve been looking for the drops to continue. While we saw the big drop after the Brexit vote, everything gained by that market drop, (actually more accurately- recovered losses) was again lost and then some in the following trading days. Disappointed in seeing my accounts turn deep red again….I’ve sought the Lord as to whether or not I’ve been listening properly or if this is just a training exercise to learn to wait on Him. As to an answer to those questions…I’m still in the, “I don’t know” camp. I’m afraid when all is said and done, I’ll look back in retrospect and all the answers/direction will be plain to see and I’ll question myself as to how I missed it. Regardless, I am still here and believing that there will soon be a transfer of resources to the Joseph’s. Sometimes I think it would be nice to just get a divine email giving us a date and time…..but than again….where is the fun in that!? Blessings to you and all the others as we continue to seek His will for our respective lives! DOW flashed 18,088.88 as a high for a moment before hitting the current high of 18089.66. We may be at the top of this leg. Now the question is, are we at the top or are we headed for a blow-off top like James saw, breaking 18,352 with a new high the day after? Hi Phanuel – Does the 7/14/16 date seem to reveal a bottom or the start of the bottom? Just trying to see if the decline begins early next week or not until next Thursday…. We don’t want to jump in too soon if we still have upward movements…. This may only be a personal warning and NOT for everyone else on Z3…. Phanuel – That is a challenge to discern . If it were for the Z3 family then there would be contradictions to what James saw at least for the current timeline. If it was for you personally, it still reveals a loss on the trade, regardless of who would buy it, since your UVXY shares would react the same as everyone else’s who owns those shares. You only take a loss when you sell at a loss, so not sure what would trigger you to lose on the trade unless you had to sell for some reason before a profit was made. I already own shares and was going to purchase more to bring down my cost/share, but did not want to get in to early. If this is a warning dream with regards to UVXY, it may be a timing issue as there may be more of a downward movement on the price. James did not mention that he saw any dates or a time line that I know of. I don’t know the specifics of your dream, but it may be beneficial to receive further interpretation from JR and others, since you received it as a warning and many are looking at purchasing the stock. ( and some already purchased it as well) What are your thoughts? As soon as you get the green light, can you share it please? Since I know FAZ and UVXY will go up eventually, everyday, I just keep buying at low and selling them at high on each day. If it stuck there , then I just wait for it coming into money again. But I always keep some FAZ for sell at the big time. Thanks for all your revelations. And thank the Lord for all the things He has done for us. And thank the Lord for positioning us to support HIs Kingdom. Phanuel – I do understand the “Isaac” moments. I felt the Lord asked me not to sell at a time when I believed I needed to and it took everything I had to yield to Him and not sell. To this day it still makes no since to me on a human level, but God honored my obedience. I have heard many others with similar encounters of testing and trust. I appreciate your transparency Phanuel, but I do not want to read too much into what may be a personal word to you from God. I am thankful we get those words! Just did not want to cause confusion is all….. I am not specifically waiting on you. Before the end of market, I normally buy back all the safe number of FAZ/UVXY. ” Safe number ” of FAZ/UVXY, I means I buy the share without any leverage. When the share price drop, I start to buy buy more with leverage and stop loss. In Jesus’ name, I pray Father give you more wisdom, I pray Father find you being faithful. Thanks Phanuel. Can you share dream ? Some encouragement…. A person that I have been praying to be able to warn about the immenient Japan earthquake / tsunami and the stock market impact had two identical dreams from the LORD that someone had a message for them and they needed to listen. The same night I had a dream where the LORD told me that it was time to speak to them. Laughing. Cos blow me over, they are so stubborn and difficult to share with and help but their heart had been prepared and they listened and took immediate action. Hope that helps someone else. On blow me over…Typhoon Nepartak (means warrior). Intensifying cat. 4. Depending on the course it takes, will impact Taiwan, Shanghai and/or Japan. Hi Jane NZ. I have some friends in Japan that I would like to warn. Do you believe this would happen very soon? I have been paying a lot of attention to Japan-related posts but it seemed to me we were looking at this fall or next spring. Thanks for the update on Japan and encouragement. James, I believe you are ‘spot on’. What a gift you give us (if we only take a moment and listen). We, along with you, should work closely together in prayer, as we approach season Two (2). The Lord, through you/others on Z3 News, is communicating/warning us as to what is coming. For those invested in physical silver, don’t worry as the paper/digital price is taken down. Take the opportunity to add more. I will remind our Z3 readers that silver currently comes out of the ground in a 10:1 ratio, therefore the true value of silver is well over $100 today. I have learned/read (on more than one occasion) that when silver breaks free of its manipulation, it will “pop” to $300 an ounce (in today’s dollar value terms). However, it will likely take a few more years before the manipulators lose complete control (my thoughts). This also seems to coincide with James time frame regarding the four seasons of the dollar (when the economy truly crashes at the end of season three/beginning of season four, Silver will likely be released of its manipulation. My wife (who shops at Kroger), would call Silver a ‘Wahoo Special’, as Kroger places this sticker on heavily discounted items in their store (to which she is drawn like a ‘moth to a light’ – Giggle. Unfortunately, you wont’ read this in the Wall Street Journal. You will need to perform a little effort to research and understand this or read the divine information James provides. Either way, this truth comes directly from our Lord. Sorry, it is called a ‘Woohoo Special’…but you get the point. Smile. Good morning Timothy – just following up on your job interview and if you have any updates….. I also believe a market turn is right around the corner. Those who frequent this website know that man, without God, will always find a way to self-destruct. We see daily examples of demonically inspired insanity overtaking our world like never before. Many contributors have mentioned worldwide systemic problems that will not go away. I just read an article that explained that today’s negative interest rate bubble is NINE times the size of the 2008 subprime crisis. I urge you to read it all the way through ………….you probably won’t hear about this from the main stream media. This is simply another example of a major economic problem that will contribute to the financial disaster we see coming in the months ahead. The 9 min video shows what a disaster and complete inane fiasco we are in per the government.